September 21, 2015 - Soft Opening. Thank you to everyone who came to visit on our first day! We saw over 400 people. We are now open with new extended hours. 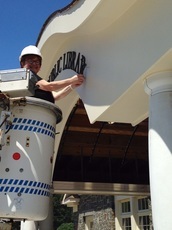 Terry Kyrios, Library Director, adds the final letter to the new Salisbury Public Library name. 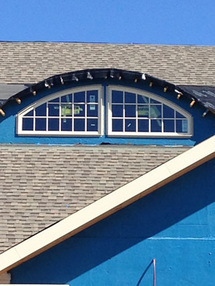 Construction is in its final stages and an opening date will be published soon. John Housianitis, of SCTV Channel 12, interviews Terry Kyrios, Library Director, Jeannette Lazarus, Chair of the Board of Trustees and Co-Chair of the Building Committee, and Dianne Masiello, Trustee, member of the Building Committee and head of the Fundraising Team. 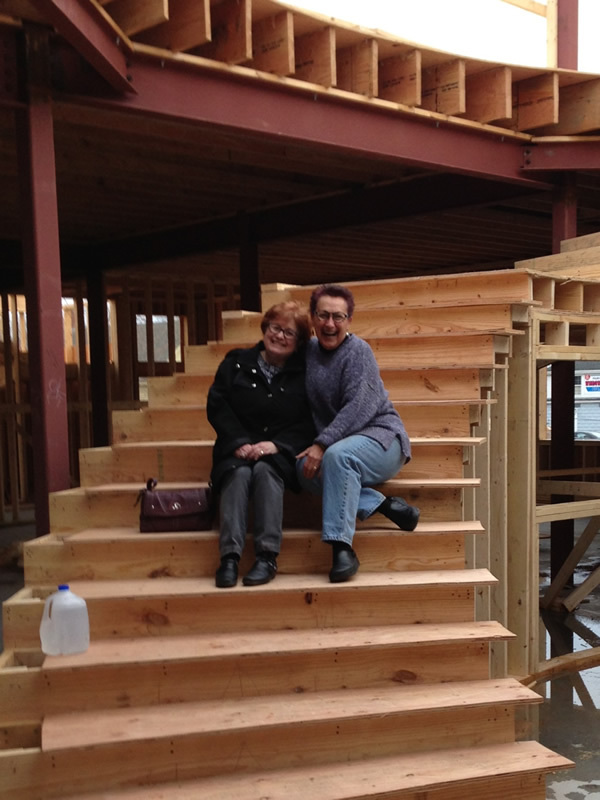 Terry and Tom Jones, Construction Site Manager for Castagna Construction, then take us on a tour of the new library. You'll be amazed at the progress. John Housianitis, of SCTV Channel 12, interviews Tom Jones, Construction Site Manager for Castagna Construction. 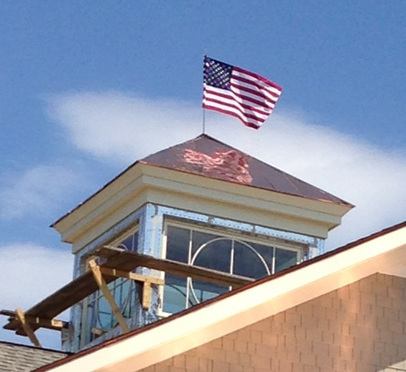 In the interview, Tom discusses the striking new cupola, along with how the construction team has been working around the impact of the harsh winter weather. Terry Kyrios, Library Director, takes us on an interior tour of the library and discusses the various rooms and areas that are taking shape. Click on the video link for a very informative update. 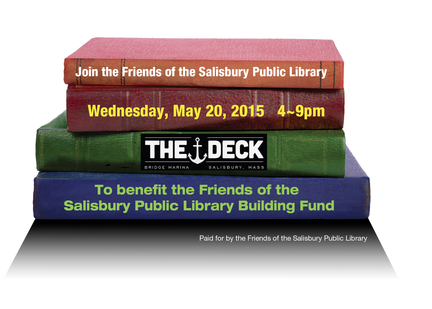 The crew at The Deck hosted a night for the Friends of the Salisbury Public Library on May 20th, from 4 till closing. There were great views, fresh air, great food and friends, and a specialty drink, "Tequila Mockingbird". Thanks to The Deck and to all who participated. Stroll through an enchanted garden filled with Fairy and Gnome homes. Look for the library's fairy house made by our children's librarian Joan Cox and Kristen Packer. Kristen will be there reading stories. Come by and say Hi ! 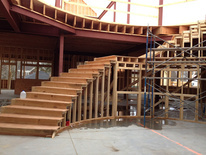 The photos below illustrate the progress being made with our new library. Library Director Terry Kyrios takes John Housianitis, of SCTV Channel 12, on a tour of our new library's construction in progress. 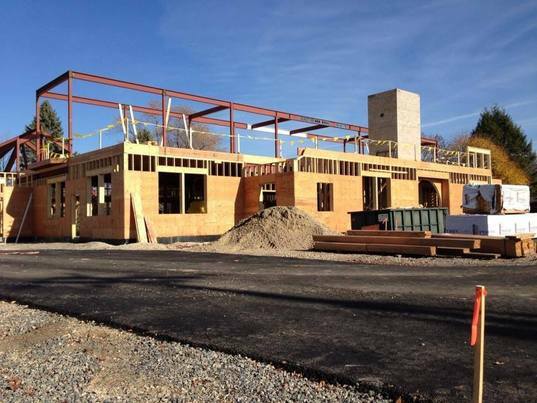 Watch this video to get an up close view of the progress being made, and hear from Terry, as well from Tom Jones, Construction Site Manager for Castagna Construction, along with Dianne Masiello and Jeannette Lazarus of the library's Board of Trustees. 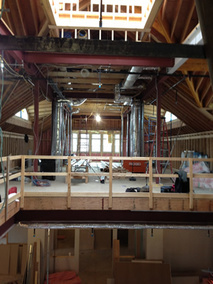 Progress can readily be seen from these updated photos. Watch for a behind-the-fence look at the new library's construction on SCTV's "Salisbury Speaks"--a big shout out to John Housianitis who makes us all look good and site superintendent Tom Jones for his enthusiastic commentary. October 29th, 2014 - Progress!! 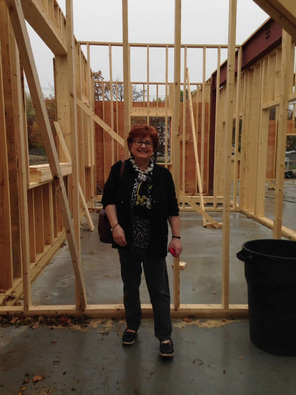 Terry Kyrios visited the construction site, as she often does, and was able to get a perspective from inside the building now that framing is far along. 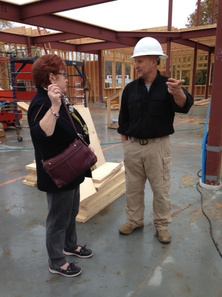 To the right, Terry confers with Tom Jones, Construction Site Manager for Castagna Construction. 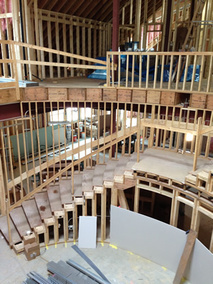 This view shows the internal layout beginning to take shape. Take a moment to stop by and see the progress that has been made since our June 6th Groundbreaking. Remarkable. 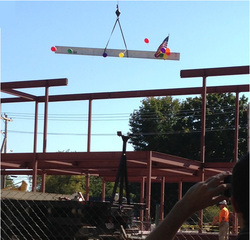 A major milestone was celebrated on Saturday with the placement of a beam signed by many of the people instrumental in the creation of our new library. The overall structure is taking form and the crowd of folks present at the ceremony is indicative of the enthusiasm the town has for our soon to be new home. Click on the photo to the left to view a gallery of photos taken during the event, along with more recent photos of construction progress. Library Director Terry Kyrios takes John Housianitis, of SCTV Channel 12, on a tour of our temporary library, located at 167 Elm Street. 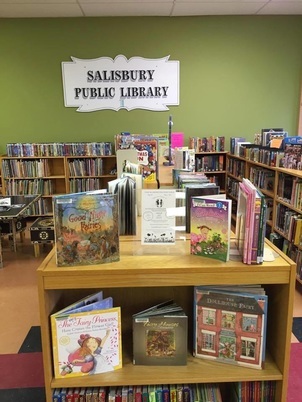 While the new library is being built, Salisbury residents can still enjoy the many benefits our library offers. Click on the video here, or tune into Channel 12 from today through July 16th for a full screen version. Viewing times are 8:00 am, 6:00 pm, and 10:00 pm. June 6th, 2014 - Groundbreaking! 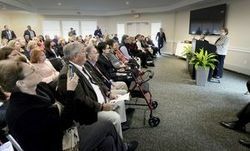 The official kickoff for construction of our new library took place today amid heartfelt speeches, an emotional glance back to how we got where we are today, and a celebratory look forward to what will surely be a crown jewel in the Salisbury physical landscape and, more importantly, in its cultural and educational landscape. The event was chaired by Town Moderator Neil Harrington, and included members of state and local government along with the current library trustees and staff. A number of energized townspeople were in attendance. For more information about the library, see the "New Library" link in the main menu. Click here for photos. 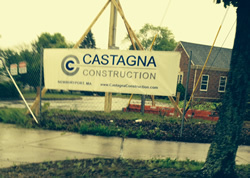 Castagna Construction has their sign in place and they're ready to get working on the demolition of the old library and the construction of the new one. You'll be able to see progress first-hand as you drive through the square each day. 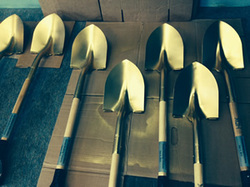 Groundbreaking ceremonies for our new library will take place Friday, June 6th, at 10:00 am, at the site of the old library at 17 Elm Street. The is an historic occasion for the town of Salisbury. We'd love to have you join us! We are well into the construction planning phase for our new state-of-the-art library that will be built on the site of our former library at 17 Elm Street. 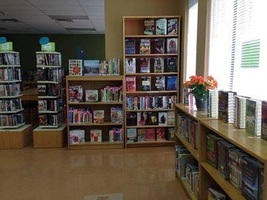 In the meantime, our temporary location on Route 110 at 167 Elm Street in the Rangeway Plaza is fully staffed, equipped and ready to meet your library needs. 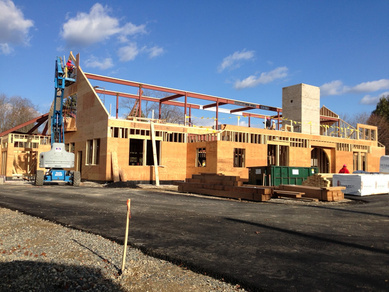 Newburyport's Castagna Construction has been awarded the contract to build the new library. Please visit our website to check on progress over the coming months. If you have any questions, please contact Terry Kyrios at 978-465-5071. Click here to get additional information about the history of the new library project . 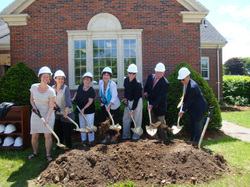 Newburyport's Castagna Construction has been awarded the contract to build the new library. The temporary library opened on May 5th at 167 Elm Street. Please pay us a visit. The space is bright and cheery and our friendly staff will help familiarize you with our layout.